Do keep a watchful eye on pests and diseases. Warmer temperatures in June can help insect populations mushroom rapidly so check your trees regularly to prevent any infestations and the damage they cause from getting out of control. Continue prophylactic spraying to help prevent the appearance of leaf diseases. Choose natural, organic sprays wherever possible to avoid harming beneficial insect species such as honey bees. 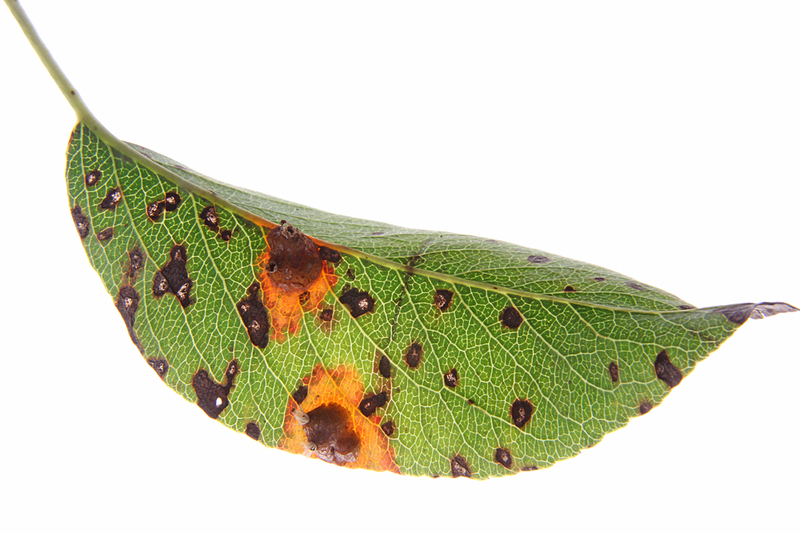 The image above illustrates what pear rust looks like on a pear tree leaf. Do consider planting palm trees in June, if you live in Florida and other Southern States in the sub-tropical belt. The warmth of June coupled with seasonal rain can create ideal growing conditions. When planting, avoid piling soil up against the palm trunk. Your city or county municipality will often have a recommend list of palm tree species from which to choose. Do arrange for for the delivery of injections for both Dutch Elm Disease and the Emerald Ash Borer Beetle. Obviously, you’ll need some Elm Trees or Ash trees in your yard to take advantage of this advice. Do water your tree if a dry spell emerges. One good weekly soak to reach the roots is better than an ineffective sprinkling every day. Do check to see if your tree mulch layer is still around two inches thick. You may have already mulched your trees as we suggested in our March Tree Care Diary (click here). However, it can get kicked away by kids (or by grown-ups!) running around your yard and, if not, scattered by visiting birds yard looking a juicy worm or two. Mulching of trees is a double-edged sword. Beware that mound-mulching (a.k.a. volcano mulching) of trees where the mulch is built up the trunk can and does cause the premature death of many trees in USA. Moisture caused by over-exuberant mulching needs to be kept away from the immediate base of the tree, especially away from where the bottom of the trunk flares out into the roots below. The dangers of improper mulching are more eloquently expressed here: https://www.gardensalive.com/product/2241 .In the photo below of a mulched tree base there appear to be two problems. The first is that mulch is piling up against the trunk and the tree root flare is clearly not exposed. Secondly, from the shadow cast by the tree’s canopy, the mulching area is not big enough to encourage healthy lateral root growth. If left like this, I predict the early demise of this tree. Do consider an Inspection of your trees by a trained tree professional. They can recommend various treatments to remedy any problems which may ordinarily be difficult to see and treat. They can also provide you with a bespoke watering regimen for your particular set of trees along with appropriate tree care that you can do yourself. Do watch out for signs of stress in your trees. June can bring stress for young trees and old trees alike in the form of unwelcome and sudden storms and the first hot days of the year. For young trees, watch out for the first sign of leaves wilting or turning a yellowy shade of green. For older trees, consider cabling as an option to secure any hazardous parts of the tree, especially if there are buildings around the base onto which they might fall in squally weather. Tree trimming such trees to reduce their resistance to wind and therefore lower their risk of falling is an option but not ideal at this time of the year when it is in full leaf. Don’t apply weed killer meant for lawns to the area of grass defined by the outer drip line of the tree. Make sure you avoid areas underneath trees as the chemicals tend to adversely affect the tree’s root system and hence affect the health of your tree. Don’t damage the trunks of your trees with mowing equipment. We mentioned this in May but it’s worth repeating – avoid damaging the trunk of your trees with your lawn mower. Don’t harm your palm trees by allowing over-zealous trimming of palm fronds. So called “hurricane cuts” are not necessary and weaken the palm tree in the face of summer storm season as we explain here.